The Butterfly Parade quilt block is a simple nine patch design and can be an introduction to the quarter square triangle unit -- one of the most commonly used quilt patches. 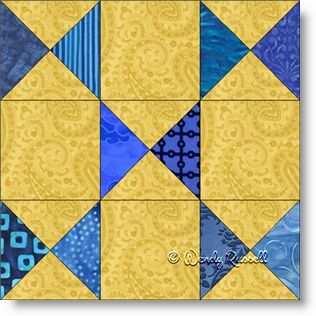 This particular block lends itself easily to using up some of your fabric stash, as it works well as a scrappy quilt block. The construction is easy, once you concentrate on your piecing skills to get those quarter square triangles the perfect size. You can also come up with all sorts of interesting quilts, by rotating the block in different areas of the quilt. So, experiment away!